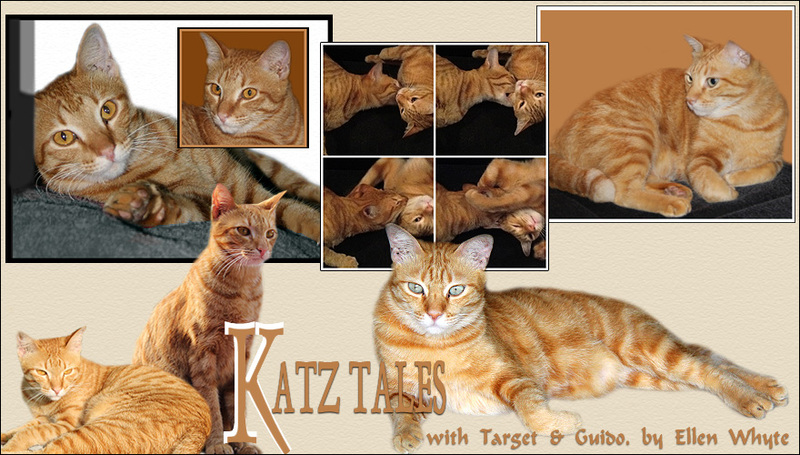 Katz And Other Tales: COT Treats! Our friend Meem sent Au and Target a present: cat treats from Addiction! Au sniffed it all over and decided he wasn't a treat type of cat but Target was charmed. Hmmm, which one shall I start with? It's nice to have such generous friends! Hopefully Target absorbs the lesson and will soon stay to say hello to visitors instead of rushing off upstairs and hiding under the bed, shivering with terror. Happy COT! For more Cats this Tuesday visit Gattina. Good morning, Target and Ellen! Meem gave me those treats for my babies too -- apple-glazed lamb and salmon treats. My babies love them! Now I know what to bring Target when I come over for a visit. What do I bring Au, then? Does he like turkey ham? Roast chicken? Anything in particular? So good! Should put all treats on a plate and eat all types together. I read your comment and you're right: it was too long ago I did a CoT! Your wish is my command *LOL*, so now I did a CoT right away. Come have a look? Target is so handsome in these pictures! Glad to see him so happy! Enjoy your new treats dear friend! Saw your comment on my blog and thanks for hurting my feeling by hinting that I hit my cats and that’s why they ran. I love them more than I should have, I tell you but I cant help it, I just love them. May be spanking connotes hitting but this wasn’t different from squirting of water at them if I don’t want them to be too naughty.I really don’t tolerate any act of violence and won’t do that to my feline kids. Molly was my best friend and I didn’t have any issue with her but she just chose to leave. Smallville didn’t have any toilet disease but will hardly manage the litter if any of the other 2 cats used it before him. I do change their litter constantly but he gets naughty when he wants to. Too bad Au is not a treat-type. Target has the treats all by himself? Target seems to be happy with his treats. Sassie always hides under the bed when we have visitors too. No one knows we have a cat unless they are a very frequent visitor! Oh boy, the gang's licking their chops wishing they could share the treats, LOL! Our Kosmo weighs around 18-19 lbs. He's been on a diet for the last couple of months but must be finding food *somewhere* because he hasn't lost very much! What a wonderful present! We love treats too! Enjoy yours! Where can I get these treats? Are they sold in the supermarkets? I keep coming back to see Target's handsome face checking out the treats! Too bad Au is not a treats kind of guy! I wish Target would let me hold him. Of my Rowdies, Pixie, Shadow and Mini-Me are very friendly and extroverted and will follow guests around and sit on the sofa with guests for a nice chat. Before Meem treats, Target's world was just chicken liver!! ah I now understand, the use of English. It wasnt like they were hit. I am really lost for the right English to use for it but it's not like they were hit in a violent way or anything but even that might not be good really. The Spank I mean here is like "a mere slapping of buttocks: to slap somebody, usually on the buttocks with the open hand in punishment"
And like you said, I stand for non-violence and I do appreciate your concern. Thanks for speaking up like a true friend. When I get angry at my cat, even if that makes me splash drops of water at them to make them to stop being naughty, we make up. They come around and I tell them sorry and they tell me sorry in their own ways too. What delicious yummy treats you have all to yourself. Silly Target. Oh well, more treats for you Au! We likey the soft treats the best!